...for the first time since 1988. That June I bought my first cd player, with three cds. I remember 'The lion and the cobra' and 'Freak out' but for the life of me I can't remember what the third one was. Another album that I haven't played for years I guess. The first three of hundreds of cds. Not that I didn't buy LPs anymore, far from. At least a couple of dozens followed, but all albums of the 60s and 70s that I didn't have yet. And all 2nd hand. Until I had to admit to myself that I had stopped playing LPs altogether. Too much bother. The 45 collection grew for a little while longer, until that also stopped, with the exception of Artic Monkeys 45s recently. Then in the second half of the 00s I switched to digital and stopped playing all those cds also. So I slowly stopped buying them, at least at the pace I used to do that. What remained is still to this day more than the average person will ever do. Generally at shows, directly from the artist with signatures and all and all time favorite's new albums. MP3 became the norm. Home burned MP3 cds, Spotify, a harddisk and iPod became the sound, well what shall we call some of them, carriers?, media? from which I listened to new records. And then I read this article on the comeback of vinyl. A very modest comeback of course, but a comeback none the same. Of course I had heard and read about it before, saw some albums in record stores. I saw youths buying album from artists at shows, but never laid the connection with myself. t just didn't relate to me. In came the 26 page article in 'Oor' of late autumn 2014, that I only got around reading last week. That article got me thinking. Why, with the sound so much better, warmer and real than anything MP3 or cd can ever achieve, don't I buy albums that I truly, truly like on LP? Having crossed that line mentally, I knew straightaway which album would be the first one. Not the number one of my 2014 list, no. Not even an album that made my top 10. The first album is a double one, a bit ridiculous, three songs to one side! Two albums with a different coloured vinyl for each album. Having the record in my hand, the beautiful artwork, the special, totally different sort of songs and music, it feels like a real treat. 'This is all yours', thank you Alt-J, it is, all very much mine. A great album it is and the sound just so nice. 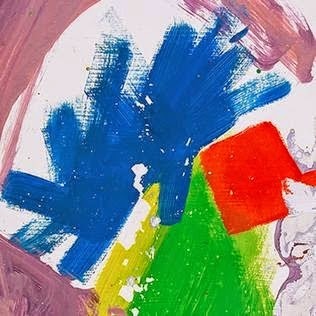 Here is what I wrote about it last year (http://wonomagazine.blogspot.nl/2014/10/this-is-all-yours-alt-j.html). To finish this story. I made a deal with myself. If I don't play the LPs in a general way, then that is the end of it. Alt-J hasn't left the turntable yet. So there is hope. Only one question remains. Where do I move the easy storage on top off the pick-up lid to?